Love your car? Hate Traffic? Well, get a better road! Discover the book to see how it could be done. To begin: This book envisions a transportation system for people –massive numbers of people– all traveling their unique door-to-door routes, all with their unique timing, and all in the comfort of their private vehicle. No trucks, no buses, no SUVs allowed. No stop signs, no red lights, no intersection,. No transfers, no congestion. A transportation of people with time efficiency, space efficiency and fuel efficiency. Automated, safe, pleasant to use. Surface streets and automobiles work well in small communities. Note that intersections and neighborhood clutter make surface streets slow. Our second generation of roadway – call it Freeway, Expressway, Turnpike, whatever – eliminated the intersection, separated traffic from clutter, and increased speeds, but its limited capacity for the multitudes, immense appetite for real estate, and resultant cost have ended the era in which it symbolized progress. The car continues to be perfected, not so the road. The writer argues that today\'s transportation solutions do not, and will not, work for densely populated, mobile societies. Simple models compare the performance of today\'s roads to that of a futuristic solution a futuristic solution which appears to be within society\'s grasp. Come join the journey and find if you like what you see. 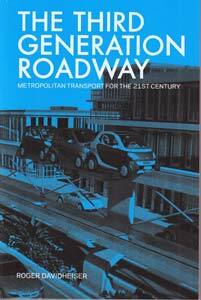 The third generation of roadway promises capacity to handle 50 times that of today\'s road. Average speeds will double. Diminutive in scale, both in required width and total grid length, its travelers will enjoy faster, safer, more ecologically sound vehicle transport. It is possible to imagine dense, livable cities with huge populations traveling freely throughout their suburbs and urban core. Amazing technology is required. But amazing technology is now in development for parallel goals. Required are the intelligent car - aware and responsive to its surroundings, the intelligent highway - electrified and capable of guiding its users, and many new structural materials and designs. But the resulting possibilities are equally amazing. Roger Davidheiser’s career extends over several decades of developing futuristic technologies within an industrial context catering to national defense, NASA, and NSF interests. He has published and led substantial efforts in superconducting electronics, passive millimeter wave imaging, high-speed electronics, developments for the wireless and cell phone industries, and studies of exotic systems such as space-based solar power farms. During the 1990s he managed the space electronics research and development program for what is now Northrup Grumman. He is a graduate of the California Institute of Technology with a BS in Physics, and of the University of Southern California with a PhD in Electrical Engineering and a minor in Material Science. He lives in Manhattan Beach, California and drives an old Volvo.